Some children show themselves to love language from a very young age. They love the sounds, the meanings, and the nuance of words. If this describes your student, they can turn their passion for languages into a career. The US Department of State has identified nine “critical languages” that are essential to economic competitiveness and national security. The national need for trained speakers in these languages exceeds the number of bilingual speakers available, so The Language Flagship supports advanced language education in undergraduate programs in several universities. A complete list and more information about Flagship Centers can be found at http://www.thelanguageflagship.org. The following colleges and universities provide intensive study in some of the nine critical languages: Arabic, Chinese, Hindi/Urdu, Korean, Portuguese, Persian, Russian, Swahili, and Turkish. Ten languages are taught in the Department of Modern Languages and Literature. Students can major or minor in common romance languages, and can minor in American Sign Language, Basque, Chinese, and Japanese. Two years of Arabic language instruction and two years of Korean are also offered. For students with successful completion of high school language classes, challenge exams are available for American Sign Language, Arabic, Basque, French, German, Japanese, Mandarin Chinese, and Spanish. Boise State University participates in the Western Undergraduate Exchange, making annual tuition less than $10,000 for Oregon residents and provides generous non-resident tuition scholarships. UCLA offers intensive language study in all nine of the critical languages. Three levels of Persian are taught, with additional courses in Kurdish, Armenian, and Berber. Turkic dialects of Turkish, Uzbek, Bashkir, and Azeri are each taught to the advanced level. Asian Languages offered are Chinese, Filipino/Tagalog, Hindi, Indonesian, Japanese, Korean, Sanskrit, Thai and Vietnamese. Slavic languages offered are Bosnian/Croatian/Serbian, Czech, Hungarian, Polish, Romanian, Russian, and Ukranian. Seven Scandinavian and three Germanic languages are offered; All levels of Portuguese are offered in addition to the more commonly studied romance languages of Spanish, French, and Italian. Ten languages, plus Latin and Greek, are taught from beginning to advanced levels and augmented by Middlebury Schools Abroad. Study abroad opportunities abound in multiple locations in sixteen countries around the world. Each summer, the internationally recognized Middlebury Language Schools transform the campus into an immense multilingual community. 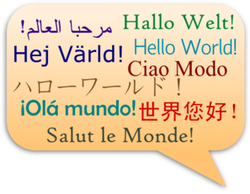 Languages of study include Arabic, Chinese, French, German, Hebrew, Italian, Japanese, Portuguese, Russian and Spanish. The popular International & Global Studies program is bolstered by 37 campuses in sixteen countries abroad. The Department of Modern & Classical Languages and Literature offers language instruction in Ancient Greek, Chinese, French, German, Italian, Japanese, Latin, Persian, Russian, Spanish and Turkish. The Japanese language and literature program produces students comfortable in both academic and professional settings, going on to succeed in business, teaching, and advanced degree programs. Study abroad programs support the learning of critical languages and are available through UM’s own departmental study abroad trips and cooperative agreements with other university programs abroad. The Asian Cultures and Languages major offers specializations in Chinese, Hindi/Urdu, Japanese, Korean, Malayalam, Sanskrit and Tamil, and is a Flagship Center for the study of Hindi/Urdu. Other strong language programs in the critical languages are found at Arizona State University, Brigham Young University (UT), Bryn Mawr College (PA), University of Hawaii/Manoa, Indiana University, University of Michigan, University of Minnesota, University of Oregon, and Portland State University. Students who have reached proficiency in a language in high school should make sure the college program teaches to advanced levels.